Before Better Call Saul hit the small screen to become a breakout hit, with some claiming it better than its predecessor Breaking Bad, it was unclear how many actors and characters from the original series would actually be appearing. We knew fairly early on that Bryan Cranston and Aaron Paul would not be reprising their iconic roles as Walter White and Jesse Pinkman in Season 1. 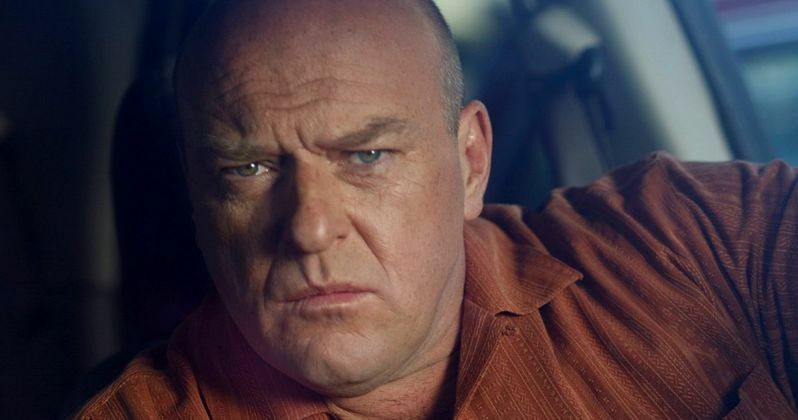 Now, we have confirmation that Dean Norris, who played beloved DEA Agent and Walter's brother-in-law Hank Schrader, won't be back either, at least not in the remaining 5 episodes still to air on AMC. "We'll have to wait and see on that. I can tell you not in the first season, that's for sure. But we'll see what happens after that. There's already a second season coming up...So, we'll see what happens!" You can watch the entire exclusive interview segment with Dean Norris below. This past Monday, AMC debuted the fifth episode of Better Call Saul Season 1 titled Alpine Shepard Boy, which marks the midway point. As of now, no other main Breaking Bad characters have popped up on the show aside from stars Bob Odenkirk, who plays the lead, and Jonathan Banks, who plays Mike Ehrmantraut. There are still five more episodes to go in this 10 episode run, so that may change. And the series has already been picked up for Season 2. Its quite possible that DEA Agent Schrader will live to ride another day, but we'll have to wait until 2016 to see that happen. Is This Breaking Bad Character Returning in the Better Call Saul Season 2 Finale? Walter White Not Returning in Better Call Saul? Jesse Pinkman Returning in Better Call Saul Season 2?